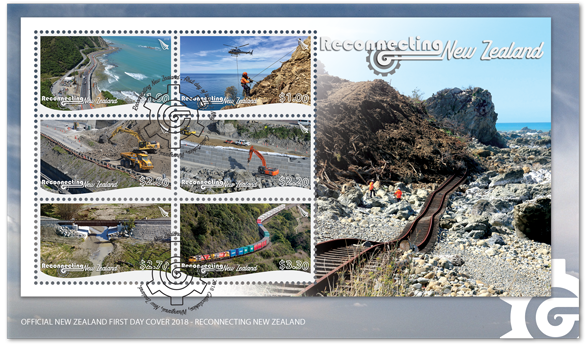 Virtual New Zealand Stamps: 2018 Reconnecting New Zealand. This is a spectular set of stamps. 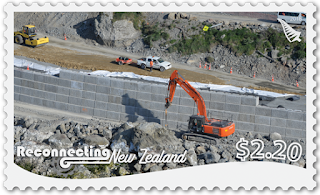 They have used the pictorial format to produce six large stamps showing the work and scope of this large project. The subjects of trucks, trains and diggers would appeal to thematic collectors as well. There are also some great photos on the covers and miniature sheets too with lots of good information regarding the views on each stamp in the presentation packs. Well done NZ Post! 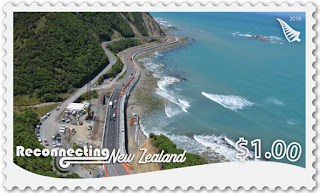 It took one year, one month, and one day to reopen State Highway 1 after the magnitude-7.8 Kaikōura Earthquake on 14 November 2016. Freight trains had returned to the railway just 10 months after tracks had been thrown into the sea. In all, 1,700 people worked more than 2 million hours to move mountains and reconnect the communities isolated by the quake. It was an extraordinary response to an extraordinary seismic event: 21 faults had ruptured, generating the strongest ground shaking ever recorded in New Zealand. The South Island itself moved, thousands of landslides came down, land rose and slumped along the eastern coast. Transport infrastructure was devastated, with coastal and rural communities isolated overnight. The instant disruption to tourism, freight and primary industries was felt nationwide. The North Canterbury Transport Infrastructure Recovery alliance was set up to restore the network, and keep traffic moving on alternate routes. 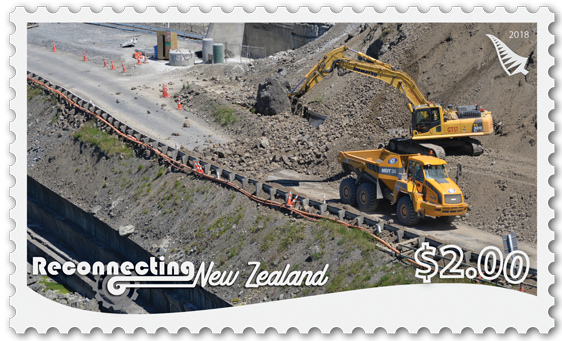 This partnership between the NZ Transport Agency and KiwiRail was new territory, as was the collaboration of Downer New Zealand, Fulton Hogan, HEB Construction and Higgins on such scale. With work sites spread over a large geographical area stretching from North Canterbury to Marlborough - some very remote - the recovery effort sought to merge the knowledge of local contractors with resources from all over New Zealand. The team would grow to 1,700 people from over 100 organisations over 2017. It was a national effort, with supplies travelling the length of the country. Bridge beams and seawall blocks were manufactured on both Islands and brought to site by road and rail. It wasn’t until early Spring that supplies could be moved between sites north and south of Ōhau Point, where the largest landslide had fallen. Repairs on the Main North Line represented the largest rail construction effort since World War II, with 220 work sites along 190km of track. Kaikōura harbour was returned to the community exactly one year after the quake, and the NZ Transport Agency committed to reopening SH1 on 15 December. Due to rain, the team was pushed to the wire. In the hours before the gates swung open, the updraft from helicopters was used to dry the road so chip seal could be laid in order to make good on the promise to open the road. The isolated communities were finally reconnected. Though the landscape remains fragile and there are still significant improvement works to do, the rebuild is a testament to what can be achieved when people work together with a clear vision and determination. $1.00 - Shape of the Future. At Irongate Stream north of Kaikōura, SH1 was moved seaward and away from a large landslide. A new seven-span bridge sweeps from a bluff at the southern end, landing on its new alignment atop a seawall. The old road will eventually be used as a rockfall catchment area. More than 100 bridges needed to be repaired or replaced after the earthquake. Taking about three months to complete the superstructure, the 144m bridge at Irongate was the fastest build of its kind in New Zealand history. $1.00 - Taming the cliffs. Geotech teams and abseilers were an integral part of the transport recovery. In the early months they acted as ‘spotters’ that warned crews below if a landslide started to move. Working from hilltop base camps, some only accessible only by helicopter, they helped dislodge boulders and remove vegetation from the slips. They also installed geomesh and rockfall fences on the slopes. One very special job was helping the Department of Conservation to retrieve seeds of the rare Ōhau rock daisy. The plant grows only on the bluffs of Ōhau Point north of Kaikōura and was almost wiped out by a landslide. Some landslides generated 10,000 truckloads of material, always peppered with large boulders. All of the rubble needed to be transported through narrow work sites along the coast, often relayed to temporary stockpiles which could grow to two storeys high. Keeping that fleet of dump trucks moving while bridges, culverts, roads and the railway were being rebuilt was a logistics exercise of epic proportion. This particular landslide, which came down just south of Peketa, severely damaged rail Tunnel 13. $2.20 - A hard road. Until access could be established around the largest and most complex slip at Ōhau Point, it was the ‘end of the road’ for crews working north and south. These were isolated work sites, making it difficult to get materials in. Seawall blocks, each weighing five tonnes, arrived six at a time – that’s all that could fit on the back of a truck. The seawall teams worked towards each other from each side of the Point, progressing metre-by-metre as the slip above them was cleared and secured with geomesh, making it safe to work below. $2.70 - Engines that could. Bringing KiwiRail’s specialised work trains into the coastal corridor was a priority during the rebuild. They were needed to carry out track repairs and to transport construction materials. Sometimes temporary structures were built so the work trains could advance towards Kaikōura, with permanent repairs occurring later. 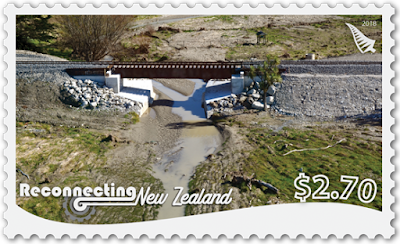 Bridge 131 at Wharenui north of Kaikōura, where readily available steel spans were pressed into use, was an example of the ‘fast if sometimes ugly’ approach that got the railway open. $3.30 - A special delivery. The first freight train to travel the Main North Line after the earthquake, pictured here south of Ōaro, made the journey from Picton to Christchurch on 15 September 2017. Hundreds of people turned out to meet the train along the way. The return of freight trains, even in a limited capacity, removed about 2,000 trucks off the alpine route through Lewis Pass. Five weeks earlier, the railway had been fully connected with a ‘final weld’ at a ceremony at Half Moon Bay north of Kaikōura. 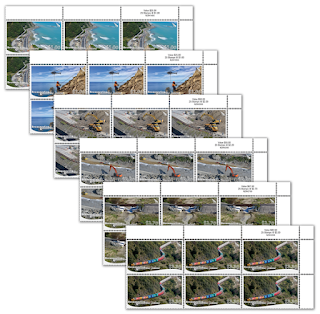 Miniature Sheet and First Day Covers. 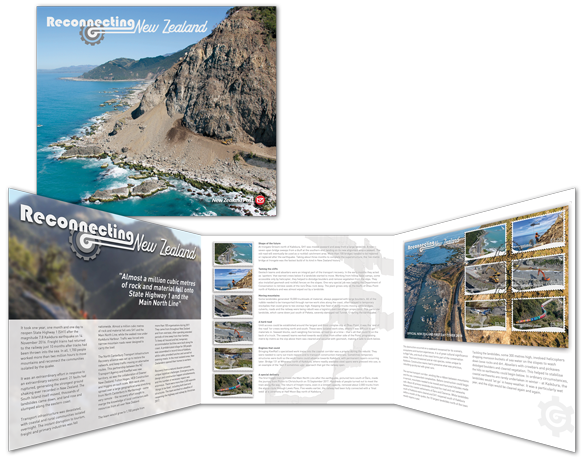 The first day cover shows the Papatea fault along the coast north of Kaikōura, a view of one of many dramatic changes to the landscape. The miniature sheet offers a close-up look at one of the severely damaged rail lines, just one of the 3,300 necessary repairs. Miniature Sheet First Day Cover - 2nd May 2018. 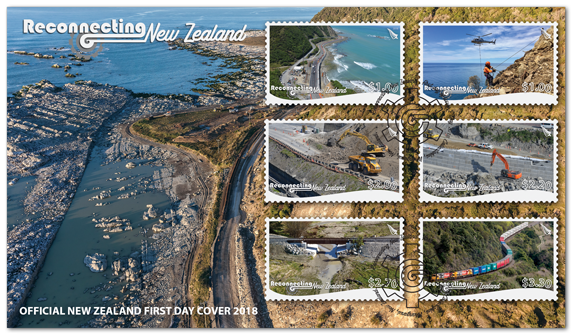 Stamps First Day Cover - 2nd May 2018. NZ Post's advertising for the pesentation pack says "Find out more about the economic and social impacts around the importance of why SH1 and the rail corridor needed to be reopened as soon as possible. 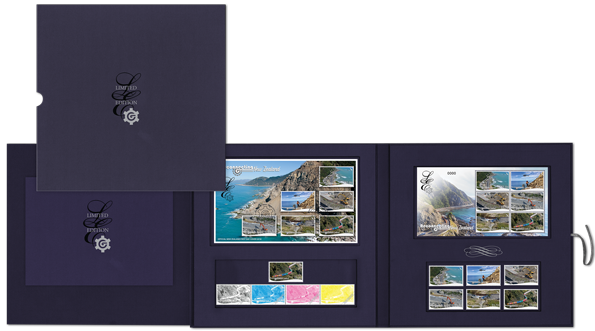 The presentation pack makes the perfect collectable, or a great gift for an engineering enthusiast." Plate Block Set of Six. Value Block Set of Six. Full Sheets Set of Six. 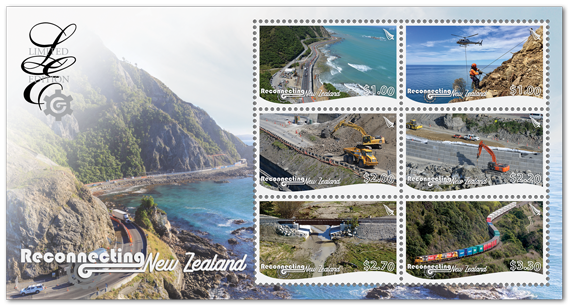 Learn more about the scope of the task that took State Highway 1 from a complete standstill to being back up and running in just over a year, and which brought rail freight back on track within only 10 months. North Canturbury Transport Infrastructure Recovery alliance project director David Loe explains how mountains were moved to reconnect communities and New Zealand. Limited Edition First Day Cover - 2nd May 2018. Date of issue: 2 May 2018. Number of stamps: Six gummed stamps. Denominations: $1.00 x2, $2.00, $2.20, $2.70, $3.30. 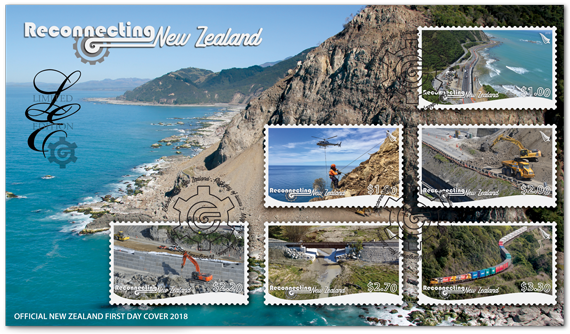 Stamps, miniature sheet and first day covers designed by: Saint Andrew Matautia, New Zealand Post, Wellington, New Zealand. 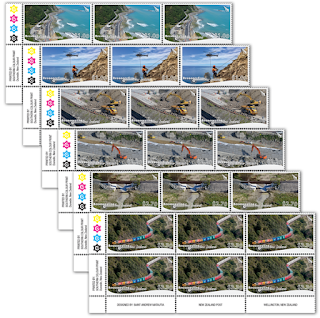 Printer: Southern Colour Print Ltd, Dunedin, New Zealand. Number of colours: Four process colours. Stamp size and format: 30mm x 50mm (horizontal). Paper type: Tullis Russell 104gsm red phosphor gummed stamp paper. Number of stamps per sheet: 25. Perforation gauge: 14.4 x 14. 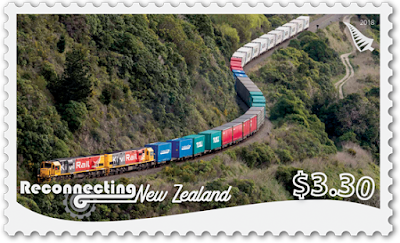 Period of sale: Unless stocks are exhausted earlier, these stamps will remain on sale until 1 May 2019. First day covers will remain on sale until 1 July 2018. I might be encouraged to collect like these. Collect stamps like your sister does. Just select modern sets you really like. 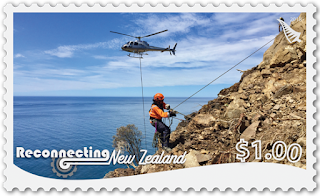 There seems to be a change in the stamp style of NZ Post. 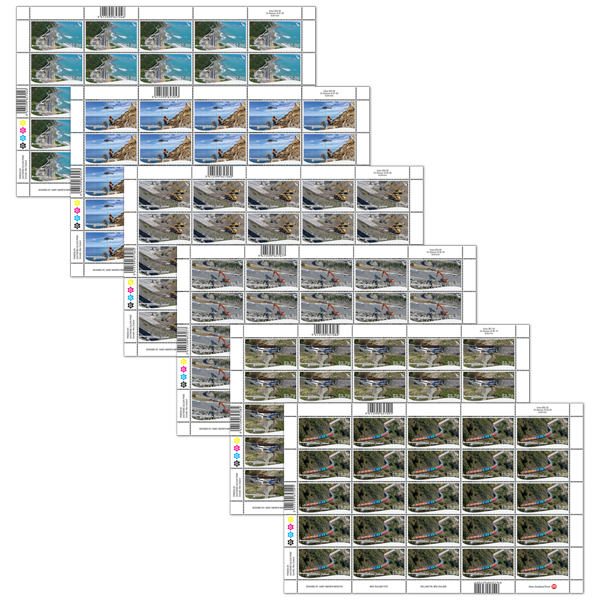 Take for example the large format photos used here. 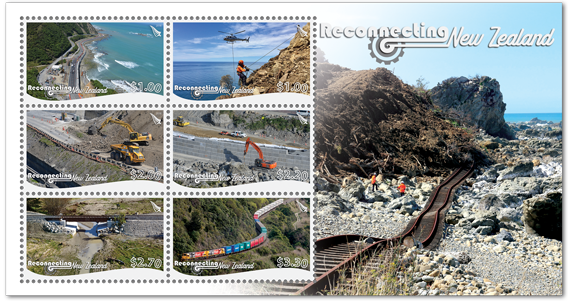 They help show us some of the work done to open the road and rails after the earthquake. I also like the new way you display the Technical Details at the bottom. While it looks Ok on a computer, it really works will on a phone.